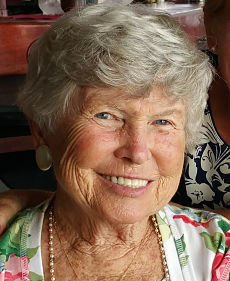 Carole Ann Stone, 82, of Surprise, Arizona entered into eternal peace on February 6, 2016 after a brief battle with malignant pleural effusion. Prior to moving to Arizona, she was a long-time resident of Goleta. Carole was born in Milwaukee, Wisconsin to Norman and Arlene Geisenheimer on March 3, 1933. She was the eldest of three siblings. Carole graduated from Bay View High School and went on to become a flight attendant for American Airlines. She married Alexander R. Stone on December 26, 1960 in Milwaukee. The couple raised their four children in the Chicago suburbs. Besides her family, Carole’s great love was the Catholic Church. She was a member of several churches in California and Arizona, and was very active in the women’s guilds. Carole also loved to garden, travel, and help others in need. Carole leaves behind two daughters, Jennifer and Debra Stone; two sons, Chris and Douglas Stone; sister Beverly Torres; brother Norman Geisenheiner; along with a host of loving nieces, nephews, grandchildren, family and lifelong friends. She was preceded in death by, and will be reunited in heaven with her husband, Alex. At her request, cremation has taken place. Mass of Christian Burial will be celebrated 10 a.m. Friday, February 12, 2016 at Our Lady of Lourdes in Sun City West, Arizona. Her ashes will then be inturned at The Historic Mausoleum at the Old Mission Santa Barbara.